Robeez baby shoes are celebrating 20 years of making fantastic baby shoes that parents love. My baby is 14 months and has just started walking. 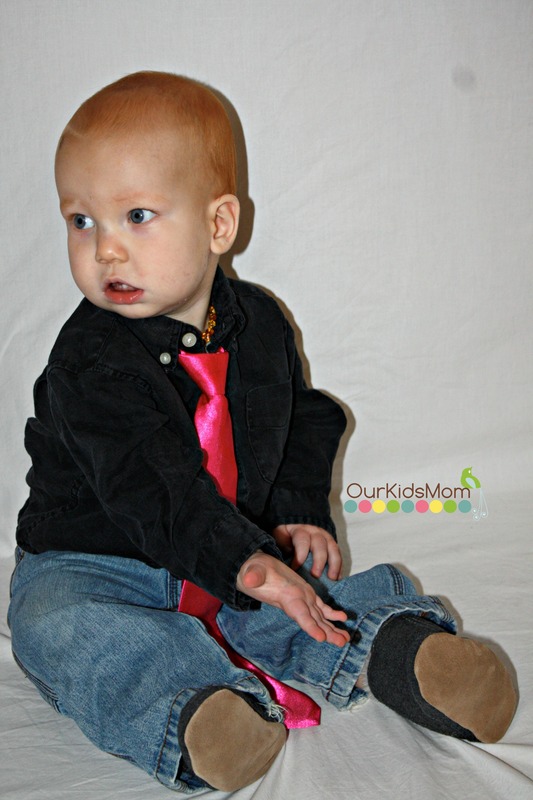 Robeez sent us a wonderful package of their amazing leather baby Soft Sole shoes and Mini Shoez for him to try out. Our babies little feet grow so fast and hard sole shoes can restrict their feet from growing and developing the way they are meant to. Bare feet are best, but often times that’s just not feasible. Robeez shoes are developed to mimic our babies bare feet. Made with durable and high quality leather and materials Robeez’s shoes are made to last the miles that our babies put on when they are learning to walk. 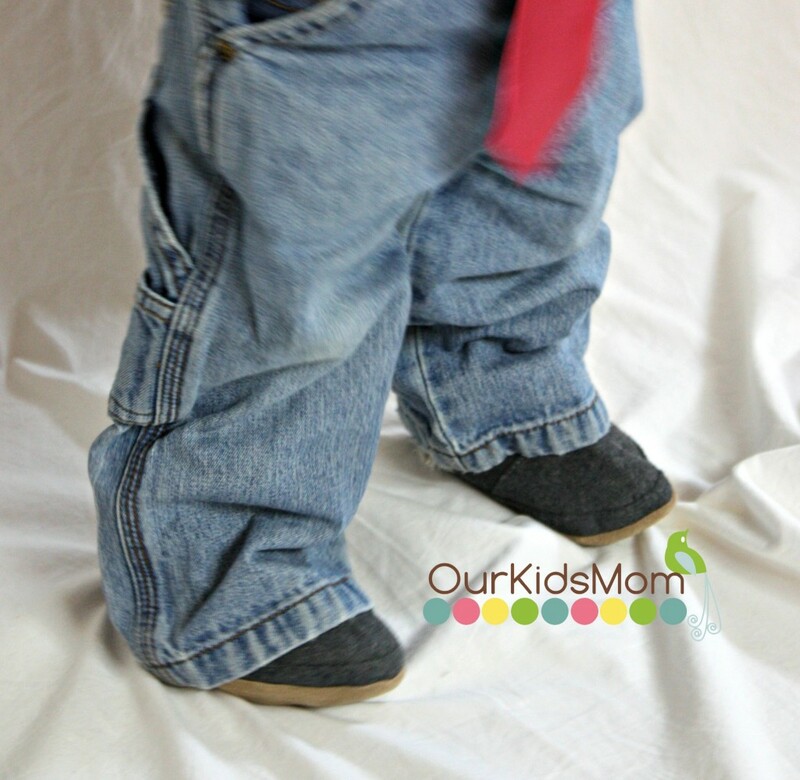 The soft soles shoes give movement for your babies feet while they grip with their toes and move as they are learning balance. The sole of the shoes are a Suede to help prevent slipping. Robeez soft sole shoes are the first shoes that I have found that actually stay on my baby’s feet. Whether he is crawling, walking, running or sitting, his shoes stay put. The key is the easy on / stay on elastic in the back of their shoes. Winter is so cold here and the last thing I want is my baby’s toes getting cold. Thanks to Robeez boots I know his toes will stay nice and warm with the soft a faux fur lining. The sides are a velcro closure that go the whole length of the boot making them easy on / easy off. Robeez also has a Mini Shoez line that are so cute and fashionable. These shoes are also made out of high quality leather and materials that are also incredibly durable and made to last. The soles of the Mini Shoez have a flexible sole with a cushioned foam insole. This helps keep your baby’s feet protected against any indoor or outdoor objects that may get stepped on. The sole of the shoe is a skid-resistant sole that gives my baby the best grip while he is cruising around. The elasticized heel is a feature on both the Soft Sole and the Mini Shoez. My husband likes this feature because it makes it fast and easy to put the shoes on your squirmy baby. 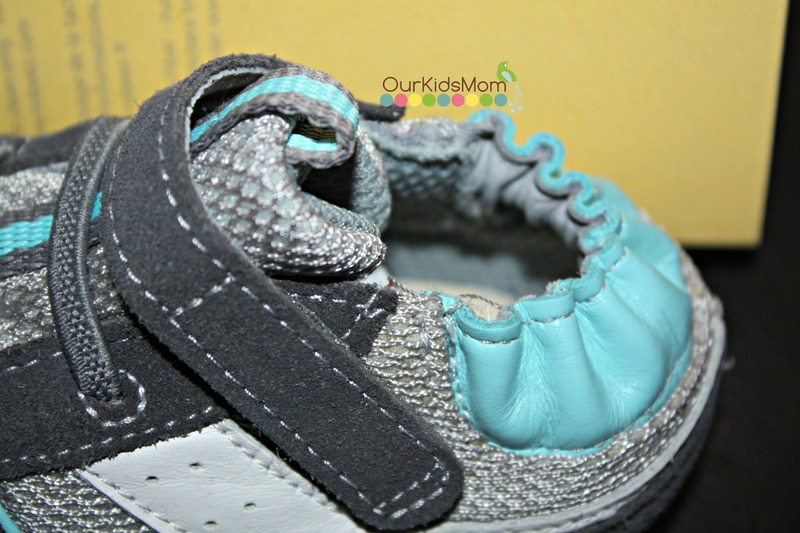 The Mini Shoez also have an easy to secure velcro closure to help keep those shoes on your baby’s feet. I have discovered how important my child’s feet development is at such a early age. I appreciate knowing that I can trust Robeez for creating a shoe that is not only cute, adorable, and stylish, but appropriate for my baby’s feet development. I have tried many different brands of shoes with my other 2 kids and none of them and I can honestly say none can compare to Robeez. 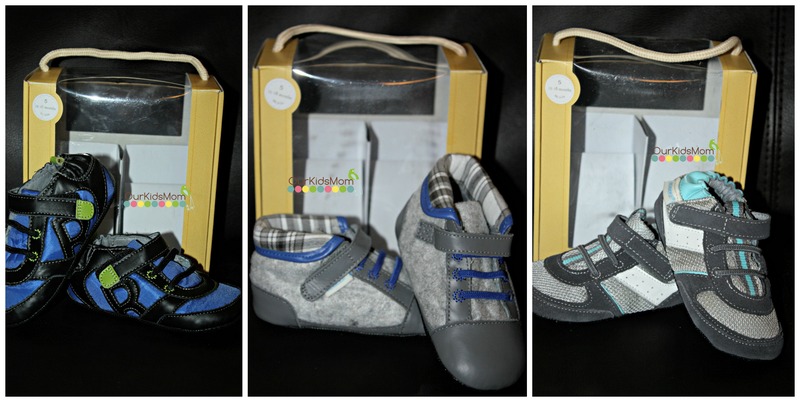 Robeez makes shoes or boots for infants, babies, pre-walkers and toddlers. 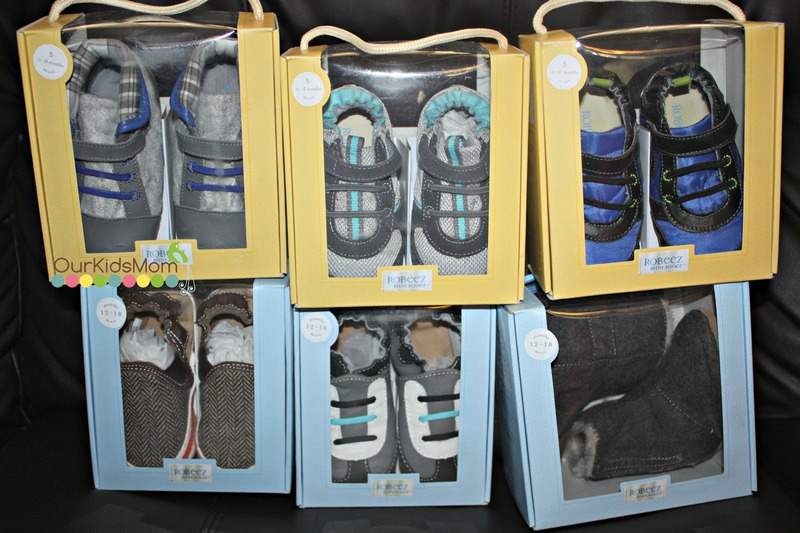 Head over to www.myrobeez.com and check out the huge selection of boys and girls shoes and boots for your little mover, or little one in your life, what a perfect and affordable baby gift for any occasion. ONE OurKidsMom reader is going to win a pair of Robeez in winner’s choice of gender & size (styles will vary and may not match the photo below)! This giveaway ended at 11:59 PM EST on November 7, 2014. I would like the Robeez Cali Soft Soles, Cream for my daughter, so adorable. Loved the Morgan or Pandora for my baby girl! I didn’t realize Robeez also designs socks/tights that are “kick proof”. Good to know! I like the Robeez London Mini Shoez in Navy! I love the little peanut soft soles in pink.. with the cute little elephants! I really like the boys Robeez Freddy Fitness Mini Shoez in grey! I really love the Robeez Cupcake Soft Soles, Brown. They are super cute! I want the Robeez Dress Man Mini Shoez, Black for my little man! I’ve loved Robeez shoes for a long time. I like how they let their feet grow as needed. I love the Robeez Classic Soft Soles Boots in both the cream and navy colors, so adorable! My boys have 4 pairs of robeez – rocket, sports, zoo animals, and white. I would love to get them a pair of moccasins to wear when they are toddlers. I like the Robeez Hannah Soft Soles, Black. I learned that they have a Disney collection! I love the cozy soft mocs in taupe! Oh love Robeez!! I would love to have the Robeez Cowgirl Soft Soles Jellies!! I learned that Robeez makes shoes for newborns to two year-olds that promote healthy foot development while being fashionable and fun to wear. I like the kickflip.. that looks like something my husband would have to have!!! I love the quality of the shoes, comfy for my little one. I want the Robeez Fisherman Sandal Navy Soft Soles for my new little grandson. i absolutely love the Robeez Cozy Moccasin Soft Soles, Taupe ! soooo cute my little boy would look adorable. I love these obeez Lil Snow Dayz Soft Soles Boots in pink. I also learned they have free shipping on orders over 50. I like the casual Fridays soft soles in hot pink – cute ! I love the little girl’s Fuzzy Bunny Soft Soles! These are the cutest shoes ever! I like the Robeez Averie Soft Soles the best! I adore the Robeez Friends Wrap Around Soft Soles, Navy shoes. I love the Rhino…so cute! I like the girls Robeez Finleigh Soft Soles, Pink. OMGodness… I am lovin the I’m so fancy shirt, one for my lil luv bug on the way & one for mama! Thanks for the uber sweet giveaway!! I love how stylish they are, especially love the Mickey ones. The Curious Lions are so cute. Robeez is celebrating 20 years in business! WOW! I learned they are having a 20% off everything sale for their anniversary. I would love to get my granddaughter the Robeez Fuzzy Bunny Soft Soles, Pink, they are just too adorable. I love the Robeez Freddy Fitness Mini Shoez, Grey they are so adorable. I like the Casual Friday soft soles in fuschia. I like the Robeez Bow Wow Soft Soles in Orange. I love the hoot hoot suite soft sole shoes and my great niece would look adorable in them. So many great styles…love the Robeez All Star Rodney Soft Soles, Navy/Gray. Thanks for the chance to win! I want the All Star Rodney Soft Soles, Navy/Gray. I want the DIGI DINO slippers!!! SOOOOO adorable! I love the Charming Charles soft sole shoe – adorable. The soft sole slippers look perfect for winter! I liked the Robeez Classic Soft Soles Boots and I like that they make socks too. I love the Winter Rush Mini Shoez! Robeez Cozy Moccasin Soft Soles, Taupe are my favorites. I like the Brown Robeez Cupcake Soft Soles. I love the Robeez Cozy Moccasin Soft Soles in Taupe for Boys. I really like the Robeez Bridget Mini Shoez in White. I like the Robeez Dress Man Mini Shoez, Black. Oh I love the Robeez Fuzzy Bear soft soles. Those are just the cutest. I love the Robeez Classic Soft Soles Boots, Pink. I like the Robeez Fancy Floral Soft Soles, Cream. I learned that they have Disney characters coming. I would love to get the Robeez Mickey Geo Soft Soles in Navy for my nephew, but I doubt they will be available this month. I would pick the Robeez Max Soft Soles in Camo for my nephew. I love that they also make socks that are slip proof. Such cute shoes too ! I like the Robeez Little Peanut Soft Soles, Pink. I would love to have the comfy Robeez Cozy Ankle Soft Soles Boots, Brown! The Robeez Mouse Soft Soles are adorable! I love them all including robeez freddy fitness mini shoez!